Christmastime is here! And I’m back with this years Christmas cards (here’s a link to last year’s – our first married Christmas)! Our Christmas cards went out a little later than expected this year – but it all worked out in the end! Around the time that we were getting ready to design and order our cards, we confirmed that we would be joining our church on a mission trip this upcoming spring! 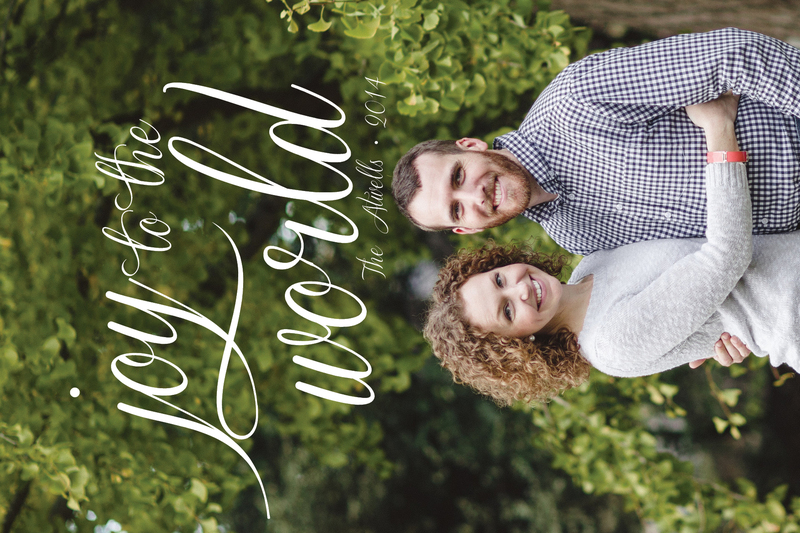 To say we are excited for this opportunity is an understatement, so we felt like the “joy to the world” was only appropriate to be quoted on our cards! We’re excited to be taking the joy of our Lord and Savior across the ocean to Madagascar! We also included a letter with the cards to tell a little bit about our year, and about our upcoming trip. We hope this card finds you ready to celebrate our Savior’s birth in just a few short days. We’re so grateful for all that the Lord has done for us this year. Around this time last December, we had just moved from North Carolina to Georgia, and since then we truly feel like God has settled our hearts here. Gary has continued to work as a Production Supervisor and also started online classes for a Master of Divinity through Southeastern Baptist Theological Seminary this past January. Rachel began serving our church as the Administrative Assistant in April. Another highlight from our year was celebrating our first anniversary in Maine! It was great time to see, explore, and enjoy a few days in a new area of the country! This upcoming year we have the opportunity to take another trip – this time with the mission in mind to share the joy of our Savior to the other side of the world! Our church has partnered with a missionary family in Madagascar and through them, we’re focusing on reaching the Antandroy, a people group with little or no access to the Gospel. On this trip, we’ll tell the creation to Christ story to the Antandroy people in the village of Bekily. We pray that through these stories, they will come to know and accept the redemption that our Savior has offered us from this weary world. As they believe and understand, we’ll accompany them to take the Good News to their neighboring villages! The ultimate goal of our partnership over the next few years is to build a body of believers through discipleship and eventually form churches in their land! Will you pray for us, please? We’ll be preparing for the next few months and will also be raising support along the way. We’d love for you to consider supporting us financially. The cost is substantial but we trust God will provide a way for us to go! We look forward to giving you another update when we return. ps – To watch a video about our church’s most recent trip and see some of the Antandroy faces we’ll get to work with, visit www.vimeo.com/109835514! We’re excited for these next six months of preparation and I’m sure I’ll share more in the days to come. I hope that this season you feel the comfort and love of our Savior coming to this earth as a humble servant. The Atwells wish you a Merry Christmas! And heaven, and heaven and nature sing! ps – Thanks to Tara Peddicord for the picture for our card!